Staples' Olivia Foster returns a shot at the net during Class L semifinal action against Glastonbury on Thursday. 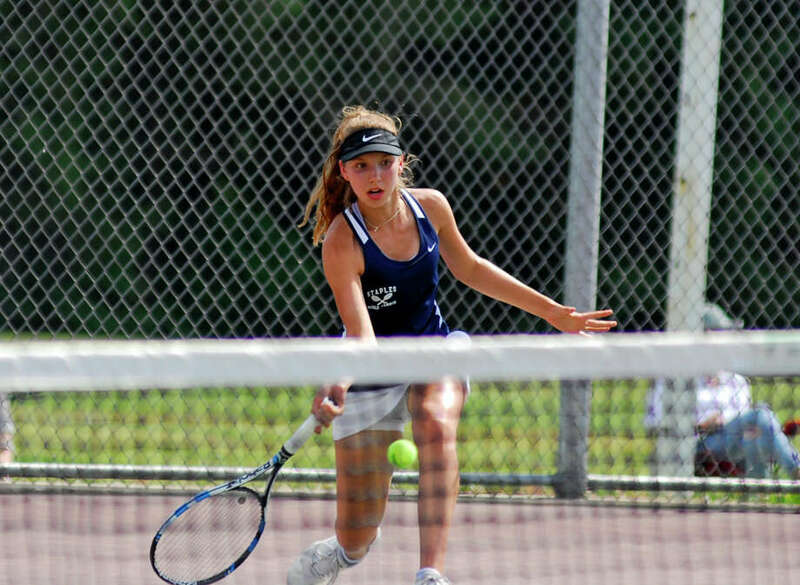 GLASTONBURY — Many of the names and faces were the same as the Staples girls tennis team visited Glastonbury for a second straight Class L semifinal, but Thursday’s match had a championship atmosphere. The two championship-caliber teams battled back and forth in a tense battle, with the Wreckers utilizing their depth at doubles to book their second straight finals appearance. Staples handed Glastonbury its only loss of the season and advanced to the Class L final with a 4-3 win over the Tomahawks. The Wreckers won all three doubles matches, as they did a year ago in the matchup. Staples (21-2) will face Greenwich indoors in Trumbull on Friday for the right to be champions in a dramatic twist after top-seeded Darien was disqualified from the tournament. Staples beat Greenwich during the regular season. Staples will be looking to come out on top after being finalists in the FCIAC tournament this year and last, as well as last year’s Class L final. Staples was down 3-2 with a pair of third sets in the remaining two doubles matches to play. All of a sudden, both Megan Brown and Kristin Butler at No. 1 doubles and Mackenzie Wood and Olivia Datyz at No. 3 doubles grabbed a whirlwind of momentum and brushed aside their opponents 6-1. Brown and Butler won the first set 6-4 before dropping the second by the same score. After a long timeout to decompress, the duo bounced back in a big way. At No. 2 doubles, Hannah Bjorkman and Gabriela Vega pulled out a tight straight-set win, 6-4, 6-4 over Eden Baker and Olivia Natale. The lone win at singles for Staples came at No. 3, where sophomore Olivia Foster pulled out another crucial win. She defeated Glastonbury’s Reilly Malz 7-5, 6-2. The Tomahawks won at No. 1 and No. 2 singles as sisters Lexi and Maddy DeNucci defeated Tess Rubin and Vanessa Mauricio. Staples’ No. 4 singles Lindy Sinclair lost to Dolly Agrawal 7-5, 6-2.